I’m sitting at my desk at work daydreaming about cooking, the blog and food (which, is pretty par for the course), and it suddenly dawns on me that the summer is winding down, and I haven’t made a single peach dessert. That’s like a crime, right? Pretty sure it’s probably illegal in some states. I immediately resolved to fix this error and bake something with peaches in it before summer was over and I missed my chance. As I always do when I resolve to bake or cook something, I polled the family to see what it was they would be interested in eating with peaches in it. I was feeling gung ho about a peach pie, but the general consensus leaned more in the direction of a peach cobbler. Now in all honesty, I’ve got nothing against cobblers. They’re fine, they taste good, but I’ve always half-thought that cobblers are really just pies that never quite got their act together and grew up. 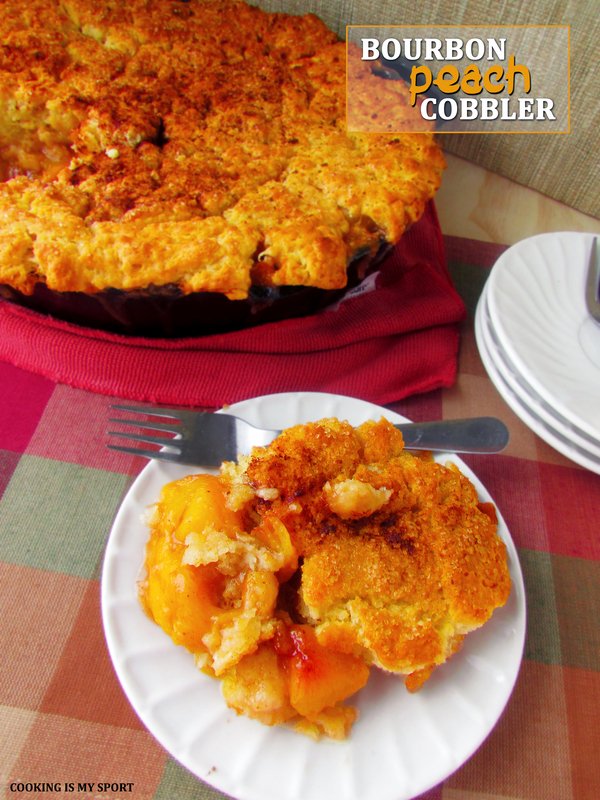 In a family of fruit dessert overachievers, the cobbler is the wayward rebel kid that’s really charming and suave, but didn’t go to college or get a job and can’t stay in a stable relationship. Jas and I got into a mini debate about this. She’s somehow under the impression that cobbler’s superior to pie because in pie there’s such a thing as “too much crust” that “overpowers” the fruit filling. She only needs the top crust that a cobbler provides. Let me repeat: she thinks there’s such a thing as too.much.crust. Yeah, I know. I’m definitely the smarter twin. But, you know, whatever. I can’t just cook for myself and to be honest peach cobbler is a world of a lot easier to make than peach pie. So I decided to go with the cobbler and save the pie for a day when I’m feeling selfish and have more time to make the crust from scratch. I had a recipe from Tyler Florence bookmarked in my Food Network recipe box for a very long time and that’s what I went with here. I did leave the bourbon out of the cobbler, so that it would be cool for my baby niece to eat, but I’m sure it adds a great compliment to the sweetness of the peaches. Rather than just throw it all in one of my glass baking dishes, I just baked it in the cast iron skillet I cooked the peaches in. It looks so much more homey and rustic, don’t you think? I also tried out a fool-proof method of peeling peaches that won’t result in you removing too much of the fruit while trying to get rid of the skin. I’m sure some of you already know this, but for those that don’t, it’s really pretty simple: set a pot of water on the stove and bring to a boil. Fill another bowl with ice water. Drop the peaches into the boiling water, and leave them there for about 45-60 seconds. Fish them out and immediately drop them into the bowl of ice water. Let them sit for about 2-3 minutes then take out. The skins should literally come off just by rubbing your fingers over the peaches. Voila. 2. 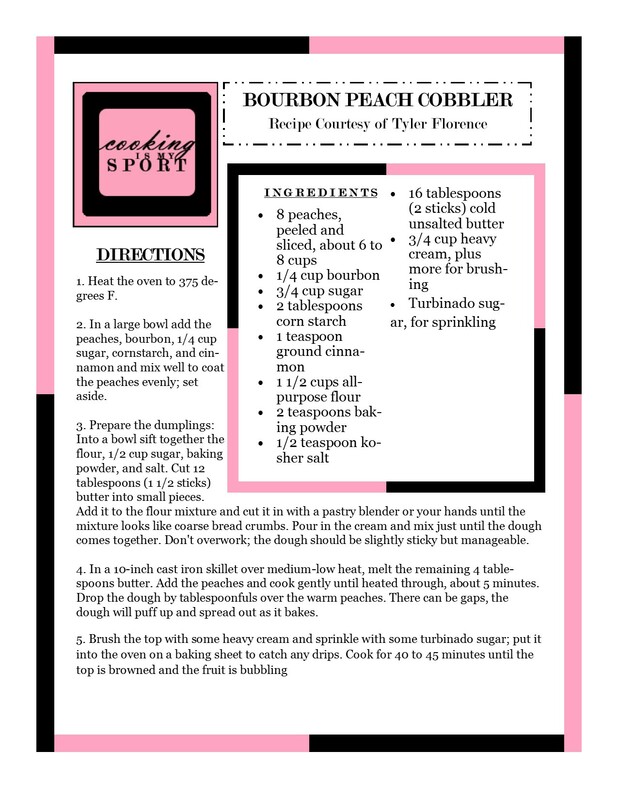 In a large bowl add the peaches, bourbon, 1/4 cup sugar, cornstarch, and cinnamon and mix well to coat the peaches evenly; set aside. 3. Prepare the dumplings: Into a bowl sift together the flour, 1/2 cup sugar, baking powder, and salt. Cut 12 tablespoons (1 1/2 sticks) butter into small pieces. Add it to the flour mixture and cut it in with a pastry blender or your hands until the mixture looks like coarse bread crumbs. Pour in the cream and mix just until the dough comes together. Don’t overwork; the dough should be slightly sticky but manageable. 4. In a 10-inch cast iron skillet over medium-low heat, melt the remaining 4 tablespoons butter. Add the peaches and cook gently until heated through, about 5 minutes. Drop the dough by tablespoonfuls over the warm peaches. There can be gaps, the dough will puff up and spread out as it bakes. 5. Brush the top with some heavy cream and sprinkle with some turbinado sugar; put it into the oven on a baking sheet to catch any drips. Cook for 40 to 45 minutes until the top is browned and the fruit is bubbling. Oh my goodness I must have some of this. Delicious. 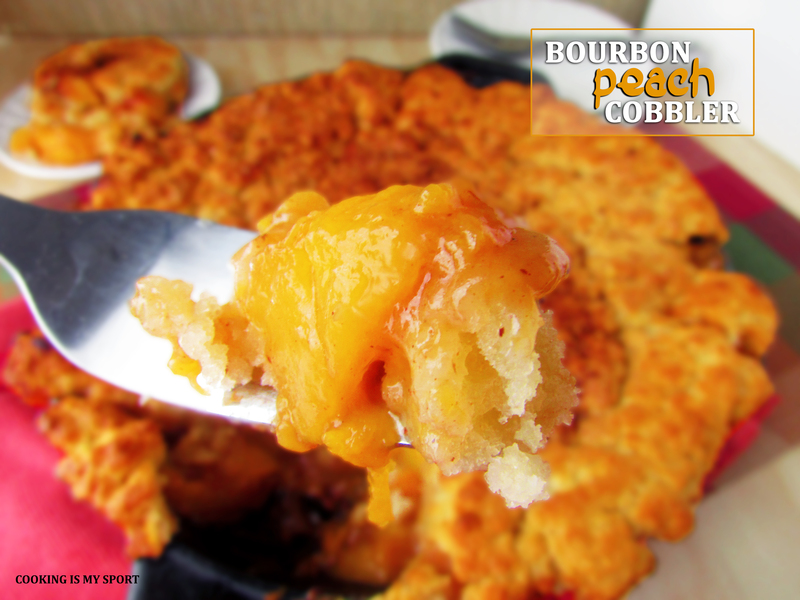 Bourbon, cobbler peaches. Wow!! You’re welcome, Jess! I’m having so much fun co-hosting! Thanks for linking my peach recipes. Whoa girl, that crust! I’m dying over here! I’m definitely with you on the no such thing as too much crust! It’s the best part! Posted	 September 13, 2014 at 10:21 am by Ngan R.
There is no such thing as too much crust! 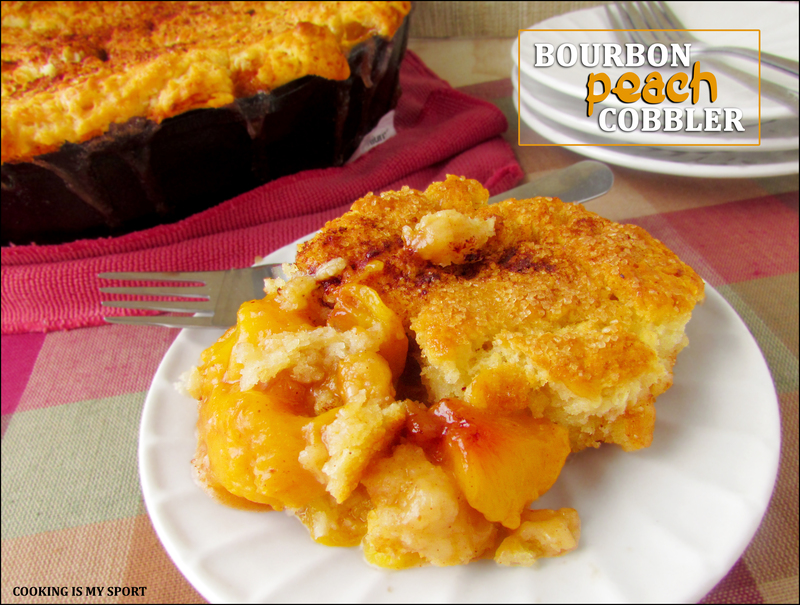 🙂 I love the thick cobbler topping here and I bet that peach filling is delicious! Looks great, Jess! No such thing AT ALL! Thank you Ngan! Thanks Nancy, I really appreciate that! 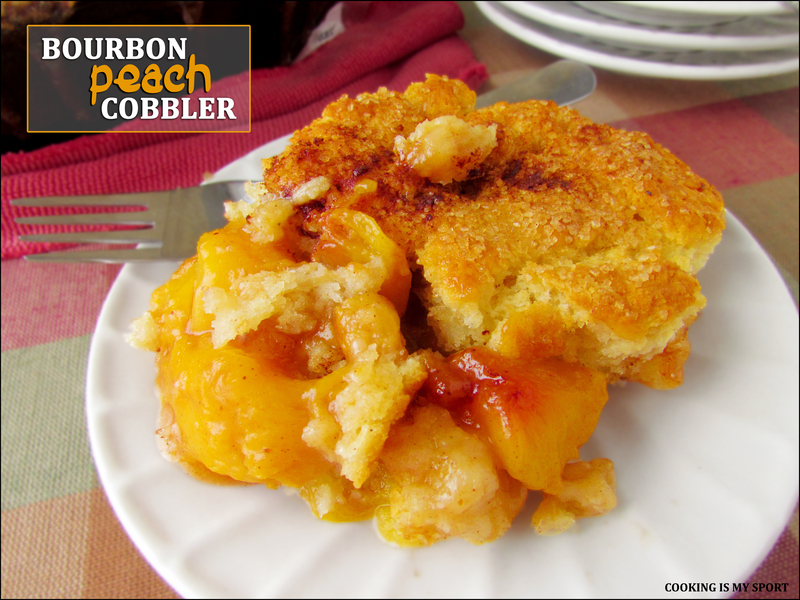 It isn’t summer without peach cobbler! 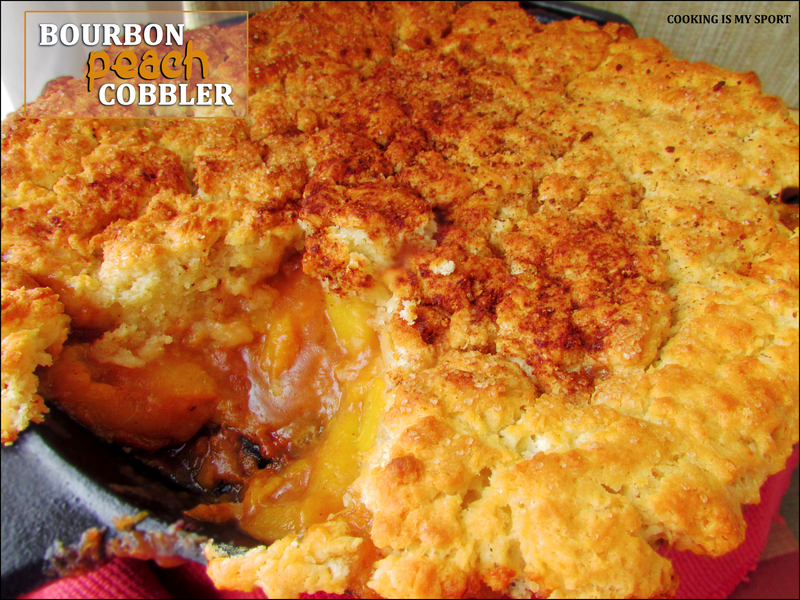 Yum, I do love peach cobbler! I probably would have chosen that over pie too! Another awesome dish! I love peaches and this is another great way to enjoy them! One of the best ways to enjoy them, for me. Thank you! Oh wow! My mouth is watering looking at the scrumptious cobbler! This is also a wonderful recipe, I love all the desserts with peaches!